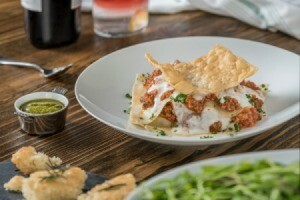 Mexican Lasagna can be made in a variety of ways but uses common taco or burrito ingredients in place of traditional Italian ones. This guide contains recipes for Mexican (taco) lasagna. I am looking for a recipe for Mexican lasagna or enchilada casserole. A very simple recipe without a lot of ingredients would be helpful. Thank you. I make this a lot. Easy and good. Cook ground beef with taco seasoning per directions on package. In a 10 by 14 glass pan put one layer of tortillas in the bottom. Fill in corners with tortilla pieces. Spread ground taco meat in the bottom on top of tortilla. Top meat with another layer of tortillas. Spread cottage cheese on top of tortillas. Top cottage cheese with tortillas. Spread refried beans on top of the tortillas. Top with another layer of tortillas. Put colby cheese on top of the last layer. Stick 6 toothpicks into the lasagna at the corners and in the middle. Cover with foil so the toothpicks keep the foil off of the cheese. Bake at 350 degrees for 40 minutes and remove foil. Bake another 15 minutes till cheese just starts to brown. Enjoy. This is better the second day. My kids love it. Layered Enchilada Casserole A hearty and satisfying "Mexican lasagna"
Preheat oven to 350 F. Butter 9x13" glass baking dish. Saute beef and onion in heavy lg. Dutch oven over high heat until brown, about 10 minutes. Reduce heat to low. Mix in chili powder and jalapeno and saute 5 minutes. Season mixture with salt and pepper. Overlap 6 tortillas on bottom of prepared dish, covering completely. Spoon beef mixture, then beans, evenly over tortillas. Cover with remaining 6 tortillas. Sprinkle cheese over. Pour tomatoes with their juices over cheese. Bake until casserole is heated through and bubbling at edges, about 1 hr. I love all kinds of lasagna recipes! I have had so many recipes, and seriously, I don't think I've found one yet that I didn't like. Such a great pot luck dish! Preheat oven to 350 degrees F. Brown ground beef in large skillet, stirring until crumbly; drain. Stir in beans and seasoning mix. Combine picante sauce and water in medium bowl, and mix well. Layer ground beef mixture, noodles, onion, picante mixture and cheese 1/4 at a time in 9x13 inch baking pan, ending with cheese. Bake 45 minutes. Serve with sour cream. 8 servings.